Heavy floods have forced the evacuation of 1,600 people – most of them campers – in southern France, officials say. They say a 70-year-old German man who was helping to supervise children at one of the summer camps is missing. The worst-hit areas are Gard, Ardèche and Drôme. More than 400 firefighters and police – as well as four helicopters – have been deployed. 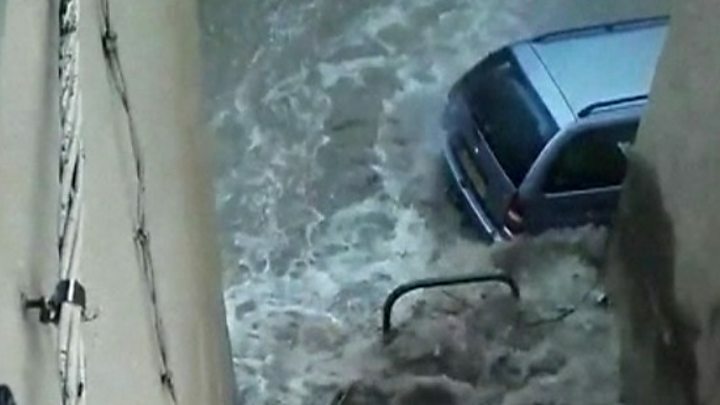 The flooding comes after southern France – and much of Europe – experienced unusually hot weather. In a statement (in French), the French interior ministry said six departments were placed on a flood alert. In one summer camp in Saint-Julien-de-Peyrolas, 119 children were evacuated. The missing German was supervising the children at the camp. Trapped by a fast-flowing torrent, he sought shelter inside his caravan – but the vehicle was swept away, the AFP news agency reports. Divers were called in, as the search operation was continuing. Several people were taken to hospital with minor injuries, officials said. Rachel Buchanan, from Oxford in the UK, was camping close to a river in Ardèche when flooding hit. “We knew a storm was imminent and couldn’t believe the ferocity of last night’s storm,” she told the BBC. “The level and speed of the river today was extraordinary – we woke up in about a foot of water. Are you in the affected region? If it is safe to do so, share your experiences with us. Email haveyoursay@bbc.co.uk.